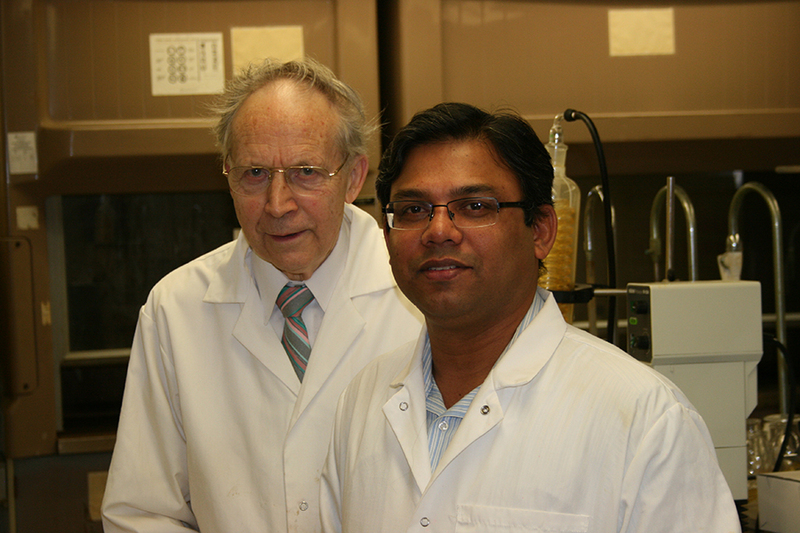 SASKATOON – University of Saskatchewan (U of S) research could yield more effective and less toxic chemotherapy drugs to treat cancer. Team leader Jonathan Dimmock, a medicinal chemistry researcher in the U of S College of Pharmacy and Nutrition, explained their novel class of compounds work by interacting with thiols, naturally occurring chemicals that perform several roles in cells. The approach offers advantages over existing chemotherapy drugs which target nucleic acids found in DNA. Thiols offer another approach. Among their many roles are defending cells against oxidization and modulating apoptosis—the process in which worn-out cells die. Cancer cells, by comparison, do not experience apoptosis and keep dividing out of control. Umashankar Das, a research scientist in the Department of Chemical and Biological Engineering and long-time collaborator of Dimmock, explained that cancer cells produce an excess of thiols, such as one called glutathione. Knocking down levels of these thiols reduces cancer cells’ ability to resist drugs. To address this, the team developed a two-stage attack, first knocking down thiol levels to make the cancer cells vulnerable, then hitting them again. Designing molecules that selectively target thiols produced by cancer cells that cause drug resistance is the focus of many years’ work by Dimmock, Das and their collaborators. In their latest study, they tested compounds against cells from nine different types of human cancer, including common types affecting blood, colon, breast, prostate, ovaries, kidneys and lungs. Das explained that since the compounds they’ve developed make cancer cells more sensitive to attack, they also remove resistance to standard chemotherapy drugs—a serious problem in current therapies. “Many of our compounds are what we call multi-drug resistance revertants, so we’re actually creating a much more sensitive cancer cell through this process,” he said. The team’s latest work is published in the Journal of Medicinal Chemistry. Funding support was provided through the Canadian Institutes of Health Research and other agencies. Das explained that short-term toxicity studies in mice show the compounds are well tolerated. The next step is to take the work into mice cancer models to confirm their anticancer effects in living systems. To this end, the U of S has applied for a patent and set up a technology licensing opportunity to invite partners to help develop these promising compounds.